A prominent Japanese politician has raised hackles as Barack Obama visits Tokyo by claiming it's an 'open secret' that he and the first lady are headed for divorce, and that the president has been using Secret Service agents to cover for him as he pursues extramarital affairs. 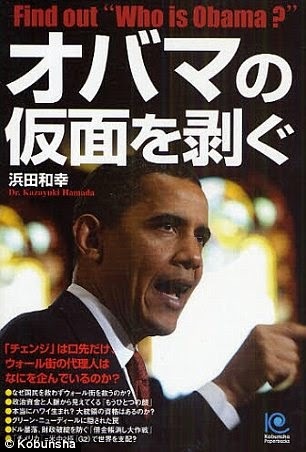 Kazuyuki Hamada, who sits in the upper house of Japan's parliament, earned his PhD a half-mile from the White House at George Washington University, and emerged as a shrill commentator on America's economy and foreign policy. In 2009 he also joined the ranks of the so-called 'birthers,' arguing in a book titled 'Who is Obama?' that the president likely wasn't born in the United States. But it's his more recent writing that's capturing the attention of the international press this week. Hamada complained April 5 on his official blog about Obama's decision to visit Tokyo without first lady Michelle Obama in tow. 'His approval numbers are dragging down near 30 per cent,' Hamada wrote, according to an English translation. He had stiff words for the impact of the first lady's multimillion-dollar 'goodwill' trips to far-flung places on the taxpayers' dime. [...] Continued/Video @ Daily Mail.